The Futura Electric Shampoo Chair features a safe, low-voltage electric drive motor, 110 volt 9.7 amp digital power supply, water-proof hand-held control wand, lock-in-place kick-out legrest, and water-shedding rear apron. Smart urethane arms move with the chair. The most advanced shampoo chair available! It will comfortably accommodate customers that range in height from 5'0 to 6'0... and it's affordable! The Futura chair can be ordered in any color of commercially available vinyl, PLUS it is available for prompt shipment in QSE Wallaby Black. The 50-60 is designed for use with backwash-styled bowls that are mounted at a 34" to 35" height and is rarely recommended for use with traditional rectangular-shaped or heart-shaped bowls. The Futura chair lifts 300 pound clients and measures 25"W x 29"D x 27"H. In the fully extended position, the chair measures 25"W x 50"D x 31"H. At least seven feet is required in front of the bowl to provide space for the fully extended chair and adequate clearance in front of the chair. 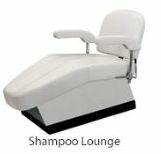 Luxe Static Shampoo Lounge w/ Lever-Controlled Reclining Back. Belize Lever Control Shampoo Chair w/silver arms, wooden armpads. Silhouette Lever-Control Shampoo Chair w/ silver arms, wooden armpads. The ALUMA shampoo Chair has solid cast-aluminum arms, a cast-aluminum footrest with powder coated steel supports and premium quilted stitching with lever control.